The policies of departed Hewlett-Packard (HPQ) CEO Leo Apotheker helped cost investors $50 billion in market value as the tech company's stock dropped from a 52-week high of $49.49 to its current price of $23.19. Now, the board wants to create a plan that could well keep the price of the stock low for some time. According to the Wall Street Journal, HP has hired Goldman Sachs (GS) to set up a series of protective measures to stop activist investors from taking large positions in its stock with the intent to force change at the company or force it to sell assets. The paper reported that "Analysts have said HP's seeming lack of direction, the management-related instability, as well as the potential for restructuring its portfolio of hardware and software assets, make the company an attractive target for investor activism." Why should the HP board take such an action? Why does management think it can do a better job reversing the slide in HP's stock than an outsider can? The answer to both questions is a puzzle. The appointment of a new CEO, Meg Whitman, the former chief of eBay (EBAY) has not helped increase the share price. Many analysts think she lacks the background to run a huge, complex tech company. 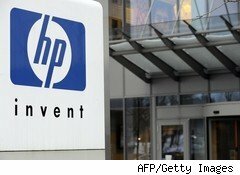 Other investors are concerned that HP's problems are too complicated for anyone to solve in the short term. Still, other investors believe the HP board essentially runs the company and that it is so dysfunctional that its actions have been counterproductive, at best. HP is an ideal candidate to be broken apart. Apotheker essentially admitted as much when he suggested that the company sell or spin out its PC division. It is the largest PC operation in the world, but its operating margins are not as good as other HP divisions. A look at HP's 10-Q shows that the company has four operating divisions plus a financial arm. One of the two largest divisions, along with PCs, is called Services. It is basically the remains of tech consulting operation EDS, which former CEO Mark Hurd bought in 2008 for $13.9 billion. The division is the most profitable at HP. It has operating income of $1.2 billion in the quarter that ended on July 31. It is hard to see how the consulting arm is related to HP's printer, software, or PC operations. The theory is that consultants help sell a company's hardware and software products. The lack of top line growth at HP in the past year challenges the idea that the consulting synergy works. HP's board may implement a "poison pill" or some other way to keep an activist investor from forcing HP to break the company apart or to issue a special, large dividend. Yet, investors might be better off if the board handed the keys to the company to an outsider. They have come as close to ruining the tech firm as possible.